Since childhood I have been practicing martial arts. From Jiu Jitsu to Kickboxing and at that time also Wing Tsun as self-defense. The problem with many martial arts is, in my opinion, that these have a certain strength, condition and self-confidence (which is fundamentally positive), but in reality they are very difficult to apply, because they are partly built up against the natural reactions. Unfortunately, I would like to know this one on my own. Krav Maga is not a martial art but a realistic and well-implemented self-defense system. Although almost every provider of a fight or self-defense art with the fast and easy learnability of the respective system, but I cannot really confirm my experience. Especially since easy to learn also does not equal means that it is also easy to apply. Especially when stress and adrenaline are involved in the game. 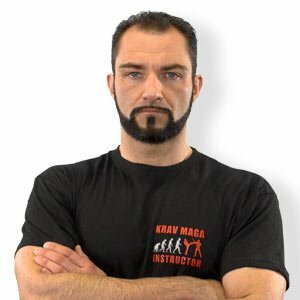 Since 2013, I have been running Krav Maga and I have reached the Instructor status at the beginning of 2017. I can say with deepest conviction that for me there is no better, more intuitive system than Krav Maga. I teach Krav Maga classes and the children’s training in a playful way, but with the necessary seriousness.